Managing Employee availability is a critical function of your staffing agency. Matching open orders to available staff must not only be quick and easy but also offer powerful and flexible matching logic to make the best placement choices. MicroStaffer's availability calendars are visually intuitive and easy to use. Availabilities can be set up for any combination using daily, weekly, monthly or even permanentl availabity schedules. 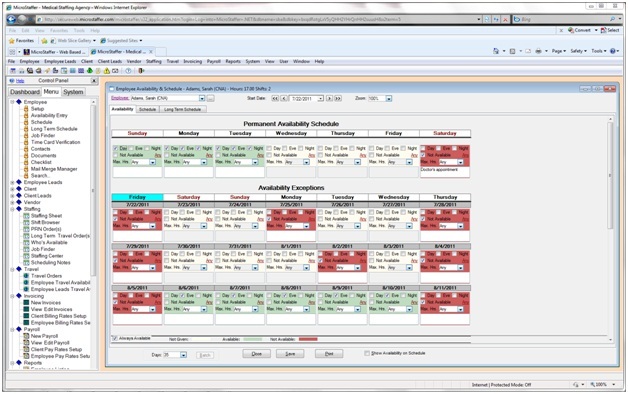 Employee can change and edit their availability over the web using MicroStaffer's Web Module. Availability's flow directly into scheduling when doing a search for available staff to fill open orders.